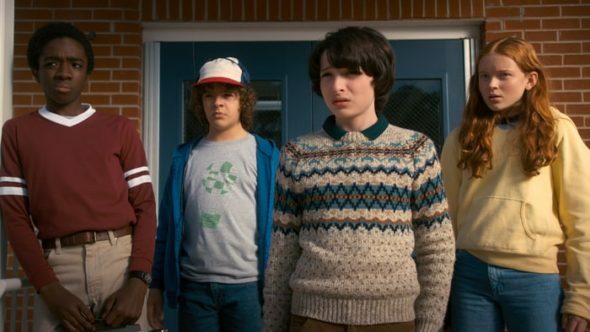 “We’re not kids anymore.” Netflix just released the premiere date and a new trailer for season three of Stranger Things. Set in the ’80s, the supernatural drama stars Winona Ryder, David Harbour, Finn Wolfhard, Noah Schnapp, Millie Bobby Brown, Caleb McLaughlin, Gaten Matarazzo, Cara Buono, Natalia Dyer, Charlie Heaton, Joe Keery, Dacre Montgomery, and Sadie Sink. Season three of Stranger Things debuts on Netflix on July 4th. What do you think? Are you a fan of Stranger Things? What would you like to see happen in the new season? More about: Netflix TV shows: canceled or renewed?, Stranger Things, Stranger Things: canceled or renewed? Stranger Things on Netflix: Cancelled or Renewed for Season Three?